Msgr. James T. McHugh’s years as head of the Family Life Division of the USCC have been years of unparalleled opportunity for prophetic witness. These have been the years when the Church was left standing totally alone on contraception, almost alone on abortion, alone on the indissolubility of marriage, alone even on the nature of marriage. Yet, incredibly, American Catholics are less certain about these teachings now than they were ten years ago, less certain both in their own minds and in their grasp of what the Church herself teaches. Somehow, the heroic stand which the Church has made for truth and human love has not been communicated to vast numbers of the laity. How has this been possible? In greatest measure, of course, the fault lies with an anti-Catholic press, and with apostate Diocesan bureaucracies. But it would be hard to deny a share of the blame to one man. Think of it this way. The Roman Catholic Church is the world’s largest right-to-life organization. For any reasonable action she can rally millions. The mere threat of her anathema has been sufficient in the past, to restrain politicians of every creed. Yet now, the leviathan seems paralyzed. In state after state, it has been tiny, lay-directed, nonsectarian groups, working against the lethargy of the clergy, who have stopped permissive abortion laws. And abortion is the only issue on which there is even a semblance of fight. The Federal government peddles birth control to the poor, and nothing is done. State legislatures head toward no-fault divorce, and nothing is done. Minors are given contraceptives, and the Hierarchy is silent. Why? Whose advice is being followed? Who is telling the Bishops and their curias across the country what to do and what to avoid? Who more than any other single man has kept the Church asleep in the hour when America had no other source of hope? James T. McHugh. Many people have wondered about McHugh. They wonder what can explain his behavior — the negativism, the minimizing. Perhaps now it is possible to guess. For, in the October 7th issue of America, James T. McHugh allowed his name to appear as signatory (as giving assent) to a thinly disguised repudiation of the entire Catholic discipline of marriage. I do not exaggerate. McHugh’s name appears with six others, the seven men having constituted a committee of the Catholic Theological Society of America, a committee set up to study “second marriages.’’ But McHugh’s name alone is crucial. It is not news, sad to say, that six armchair theologians should deny the dogma and settled practice of the Church with impunity. But for an employee of the Bishops, the head of their national Family Life Bureau to do the same — indeed, to deny precisely the Catholic discipline for whose promotion and safeguarding he bears a unique responsibility — is both news and scandal. It is an act that cries out for redress. No one should arrive hastily, however, at so damning a judgment. Let us examine, then, patiently, and in detail, precisely what it is that James T. McHugh has signed. The document in America is a committee report entitled “The Church And Second Marriages.” Its aim is to argue that many Catholics, when their first marriages fail, are perfectly at liberty to marry again regardless of the findings of Church tribunals — and perfectly at liberty to receive the Sacraments, regardless of what anyone else might think. Admittedly, it seems impossible that McHugh and the other signers would have stated matters so boldly as that. But evidently they have grown bold to the point of folly. An italic superscript says the report “represents only the opinion of the members of the committee,” which opinion, in turn, is said to be a “contribution” to the study of second marriages which is presently being conducted by the American Bishops and the Holy See. It is a “contribution” rather than “an independent solution.” In other words, the signers wish to protect themselves by conceding that the Holy See and the Bishops must finally decide. This concession is important, but not sufficient. On the one hand, it is simply not honest for a theologian to propose latent heresy under the mere proviso that if it is heresy, the Bishops will reject his advice. On the other hand, we have seen a plethora of “contributions” which, when rejected by the Bishops, suddenly become “independent solutions” after all. Look what happened to the “contributions” on birth control! After the massive revolt of 1968, are we really to believe that if Rome rejects the view of marriage set forth in this report, the seven signatories and all who have greeted their work with approval will simply line up to obey? Isn’t it infinitely more likely that certain “progressive” tribunals will quietly implement McHugh’s principles regardless of Rome? These questions answer themselves; on with the text. “It would be rash to assert that every first marriage that has failed, was invalid from the beginning, but there are serious reasons today that were either not present, or not recognized in the past to question the validity of many of them.” The text then attempts to state what these reasons are, but the exposition is so chaotic that it is rather difficult to tell exactly what is being said. Apparently, the reasons for all these possibly invalid marriages, are two: one is a certain “incapacity” which is sometimes called “psychological impotence;” and the other is “the American attitude toward marriage and divorce.” So one reason is psychological and the other is cultural. Let’s take them in that order. “Psychological impotence” is a new, but useful term for a problem which has long been recognized. Obviously a person bereft of reason by a serious mental disease cannot commit himself to marry. Habitual homosexuality might have the same incapacitating effect. As long as we are talking about definable and demonstrable maladies or deviations, the term “psychological impotence” is perfectly acceptable. But observe what Msgr. McHugh and company do with this term. They tell us that “psychological impotence” is the name “sometimes” given to “the incapacity of some individuals for the type of commitment marriage calls for.” Then they say that there is good reason to recognize this incapacity “not only as a defect that would disqualify a person for any marriage, but like physical impotence one that can be relative to a particular marriage partner.” Now we are at sea. What kind of disease is it that makes me too sick to have married Susie but healthy as a horse to marry Pauline? What kind of disease is it which has no definable symptom other than discontent with my present spouse? Behold what a chameleon is this word “incapacity”! First, it is identified with psychological disorder and then it is elided into teenage immaturity and finally it equals simple divorce rate. For despite some elaborate footwork in the sentence quoted above, the committee hangs back from really equating “incapacity” with immaturity. After all, where is the evidence that it is the least mature teen-agers who marry and then break up. This alleged “immaturity” is just a slur pinned arbitrarily to those teen-agers whose marriages have in fact failed. We are back to the observation that this mysterious “incapacity” has one and only one defining characteristic: discontent with one’s present spouse. As if to confirm our analysis, the next paragraph of McHugh’s text drops the pretended “incapacity” altogether. We are told that “Since Vatican II, the Church sees marriage and marital consent (as) oriented not simply to a particular act but to a total community of life and love.” This is fine language, except that nobody knows what the real requirements of such a “total community” are. No one can objectively say when it is present or deficient. Given that enormous ambiguity, McHugh’s next move is inevitable: “In cases where this kind of community has never developed, we believe that there is reason to question the original consent, even apart from the more basic issue of capacity” (My emphasis). In other words, the sheer fact that two spouses do not get along proves that there is no “community” and more than suggests that there never was any “community.” In which case, there never was a marriage! It is breathtaking, but McHugh and his friends have simply ignored a solemn anathema from the Council of Trent. For, as the reader may recall, that good council anathematized anyone who would allege that domestic discord cast doubt on the validity of marriage! So now it appears that an indefinite but putatively large number of American Catholics are secretly un- married, since what they took to be marital consent was in fact only American sentimentality. Here I should like to pass over several promising lines of refutation. Let’s forget about the fact that American culture has been bad in this respect for a long time without anybody’s imagining that Catholic practice had to change because of it. Let’s forget too, that Catholics have often lived in past centuries in societies that sanctioned divorce. Let’s not even mention the culture prejudices of the Church’s first pagan converts nor the divorce proclivities of first century Judaism! Let’s stick rather to a simple question. If McHugh is right, how are the secretly unmarried Catholics ever going to discover their true situation? How is anyone ever going to know to what degree a decision made in the past was “implicitly conditioned” by hostile cultural influences? There is obviously but one answer to this question, and it brings us back, once again, to familiar ground. The only way a person can determine that his marriage is null by reason of Americanism is by, in fact, loathing his spouse! The vicious circle is spinning again. Listen to what McHugh says immediately after the sentences quoted above: “Reason for concern about this is indicated also by the fact that the rate of marital breakup for Catholics approximates the general divorce rate.” In other words, because many Catholics are ditching their partners, therefore many Catholics were never married. And since something has to be to blame, why not the culture? Well, I say, why not the hairy albatross? Dedicated to Tommaso de Vio. Cardinal Cajetan, pray for us! All works herein: Copyright © William H. Marshner 1972-2018 unless otherwise noted. All rights reserved. 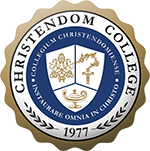 Funding for the creation of this archive was generously provided by Christendom College.